What Are the Main Differences Between Guitar and Bass? Do you have an aspiring musician in your home? Choosing which instrument to play can actually be a big challenge! For instance, two instruments - the guitar and bass - are quite similar. What makes them different? Is one easier to learn than the other? Let’s take a look at some of the key differences between the guitar and the bass. The bass guitar is typically slightly larger than the standard electric or acoustic guitar. With four strings, it is quite similar to the guitar, except for the fact that its notes are about an octave lower than the guitar. Because of this, its typical role in a band is to act as a supporting instrument. The bass provides a great foundation for the guitar to play off of. Depending on the genre, the bass will most likely work closely with the drums to create a rhythm. A standard guitar has six strings. As opposed to the foundation of the bass guitar, an electric or acoustic guitar is often responsible for carrying the main melody of the song. A lot of times guitars perform some kind of solo or riff. While both the bass and guitar can be simple to play as well as complex, the guitar may have more options. Note: What you learn on guitar will be applicable with playing the bass, and vice versa! Which Instrument Should You Choose? So which instrument should you learn first? First, take in your interest. Which one sounds more fun to play? If you still don’t know, consider our points below. Because of the size of the bass, it may be difficult for younger kids to handle and play (the strings are also thicker, and can be harder to press down) - at least until they are older. The guitar may be a slightly easier option for beginners. If you like being in the spotlight, guitarists tend to naturally get solos and exciting parts of the songs that often are remembered. 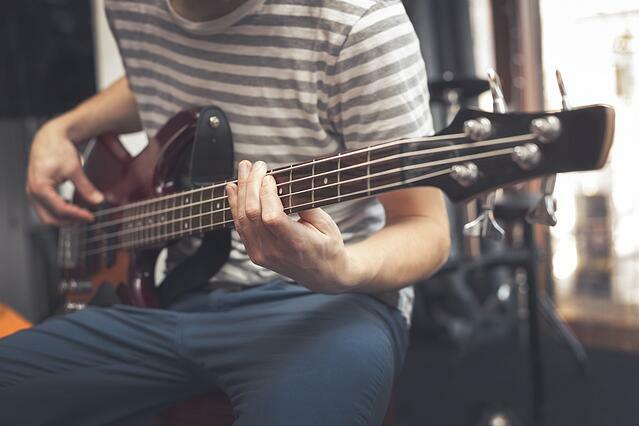 However, if you just want to learn an instrument to have fun and support a band, bass may be more your speed. Just like every other instrument, however, you’ll only get out of it what you put in! It will require a lot of practice to get “good,” regardless of which guitar you pick. Remember that you can always transfer from learning one instrument to another - who says you can only learn one? A lot of what you learn will transfer.